Many tubes, many capacitors and many (bad working) switches in the signal path and all this on a printed circuit board..... 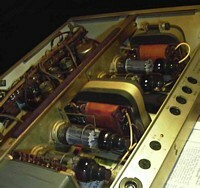 The best way to build a bad sounding amp! And then: set into nearly closed box, so that everything gets too hot. 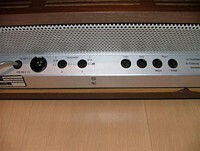 I never found out who built this amp. And I do not want to know! 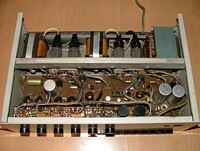 The PCBs and the printing look like Telefunken, but most of the other parts do not. 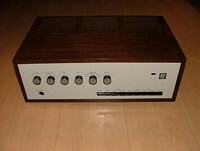 Sennheiser? PE? 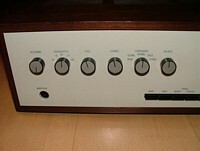 The EL504 is not responsable for the bad sound coming out of this amp - a Telewatt VS71 also uses them and sounds good. 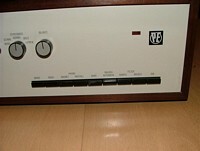 Later Telefunken made a version with split core output transfomers - with no sound improvement. 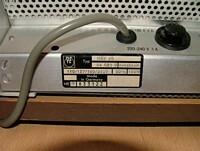 Telefunken version with split core output transfomer.